Were you ever in a situation where a file that would have to be on the router was sitting on your laptop, but you couldn't store it into the router's flash across the Telnet session or through the console port? Copy-paste the file contents. The contents should not include unmatched curly right brackets (every curly right bracket has to be preceded by a matching curly left bracket). After the file contents have been pasted, enter } and press ENTER. End the tclsh session with tclquit. 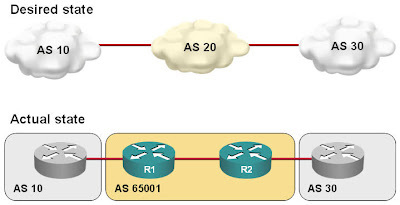 In a response to my post Redundant DHCP Server I've speculated that a Cisco router should coexist with a Windows-based DHCP server if you configure them with non-overlapping address ranges. I was wrong, Edgar Cahuana discovered that Microsoft's DHCP server wants to have complete control over the LAN it's serving and shuts down if it detects another DHCP server on the same LAN. To make the two DHCP servers coexist, you have to disable rogue DHCP server detection in Windows DHCP server, as explained in this article. The difference between rogue server detection in Windows 2000/2003 and SBS 2003 is explained in this TechNet chat. Cisco IOS allows you to define aliases for the commands you commonly use with the alias global configuration command. The alias command accepts the CLI mode (exec, configuration ...) for the new command and the string that replaces the command name. If you specify additional parameters in the new command, they are appended to the alias string. For example, if want to have the ipconfig command that displays interface IP configuration, you can configure alias exec ipconfig show ip interface. When you execute ipconfig ifname the alias is expanded into show ip interface ifname and displays the IP configuration of a single interface.